Whip up this spicy shrimp and rice bowl tonight for a satisfying meal you can prepare in less than 20 minutes! You have probably seen this dish on almost every Spanish or Portuguese restaurant menu. Camarones enchilados or spicy shrimp, are hearty, flavorful and the perfect comfort food. Once you see how easy it is to make it may just become part of your go-to menu item during the week. You can make this dish as spicy as you like. I used jalapenos in this dish but Thai chilies will go well, as well as serranos, or cayenne peppers. It’s really a matter of how much heat you can tolerate and pepper flavor. Jalapenos are mild enough so the flavor of the shrimp, pepper and onions aren’t overpowered. One way to save a lot more time is by purchasing your shrimp de-veined. If you can get them to remove the shells then even better! Prepare the rice per directions on the package. While rice is cooking prep the rest of the ingredients. Remove shell from shrimp and clean well. If shrimp is not deveined make sure to remove vein. On medium heat, heat up oil in a large saute pan then add the onions. Onions can be left as rings or you can cut them into half rings. Stir occasionally and cook until soft. Add the green peppers, the jalapenos and the garlic and stir until peppers are soft. Add the tomato sauce then add the salt and pepper to taste. Let the sauce come to a boil. Add the shrimp and cook for about 4-5 minutes. While shrimp is cooking, if the sauce is too thick add ½ cup of water and continue cooking. Remove shrimp from heat so as to not overcook. Serve the shrimp over rice. I gave up soda years ago but I still want a cool, fizzy drink everyone once in a while. To satisfy that craving I make my own soda mixing natural juices with seltzer so I can control the sweetness. It’s a lot easier than you think and much more healthy with none of the added chemicals or preservatives! What’s great is you can adjust the amount of syrup you want based on how sweet you like it. Also, the flavor combinations are endless! This ginger hibiscus spicy soda doesn’t burn as you might think but does give the drink a nice kick that will perk you right up. I also made lime ice cubes for a little added tartness. Making simple syrup is easy, just equal parts sugar and water and heating it up until sugar is dissolved and mixture is clear. Just think of all the natural flavors you can add. Get a little creative too and make a mojito soda by infusing mint leaves and limes when making the syrup or ginger and basil! It’s a wonderful alternative to the sugary stuff that’s out there now! In a saucepan on medium heat add sugar and water and stir. Add the hibiscus flowers, ginger and serrano chiles and continue stirring until all the sugar dissolves. Bring to a boil then remove from stove and let mixture cool off. Strain mixture so you are left with just the syrup. In a tall glass, add ice, 2 ounces of syrup and top with seltzer. Store the remaining syrup in an airtight container and refrigerate for up to 2 weeks. Looking for a quick breakfast to make during the week? This is it! 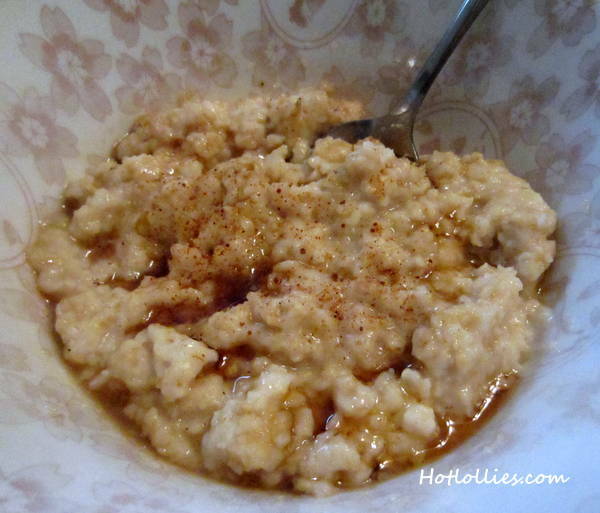 You will not see oatmeal quite the same again. This coconut almond oatmeal breakfast is creamy, spiced up, flavorful, delivers a nice crunch and you can make it in under five minutes. It will also keep you full for hours! My intention was to make a black rice coconut risotto as part of Bon Appetit’s foodies cleanse but did not have over half of the ingredients. As a home cook you just have to learn to improvise in the kitchen and make things work! It’s what leads to great recipes sometimes, just remember to write it down!! Nothing’s worse that making something great and then not being able to make it happen again. I know this is just oatmeal but I’m talking about all recipes in general. Start with the basics and then tweak and experiment until you have something special of your own. 1. Add the first five ingredients to a small saucepan and stir. Set heat to medium and let mixture come to a boil. Continue to stir for another minute and remove from heat. 2. Stir in the chopped almonds and top with cinnamon, nutmeg, merken and a drizzle of maple syrup.